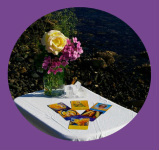 New for 2013 are my online Video Readings. These will be posted each Sunday and are forecasts of the week to come. Much love and many blessings to you. Thank you for watching and sharing! P.S. I promise that my video editing skills will improve!